Ht / Wt: 6'3" / 223 lb. 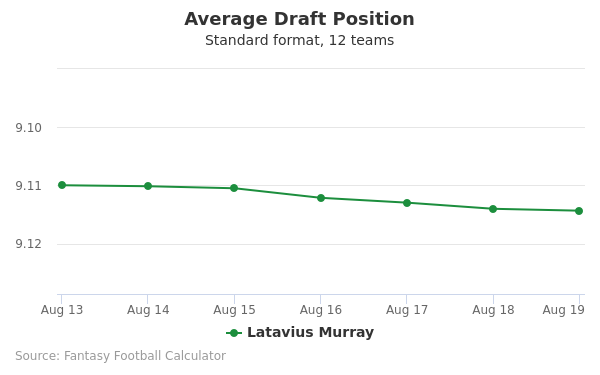 Latavius Murray's fantasy value is measured by his average draft position (ADP) in fantasy football mock drafts. 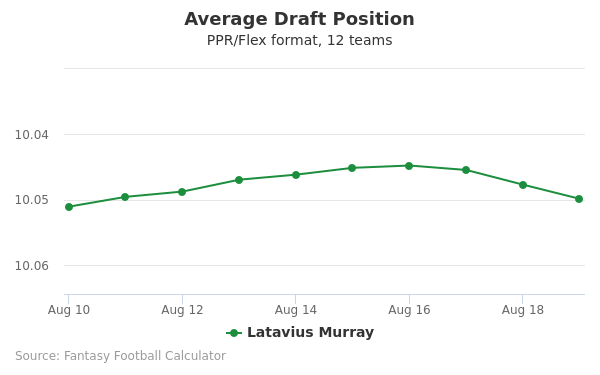 In recent drafts, Murray's current ADP is 8.05, which indicates that his fantasy outlook is to be the 5th pick of the 8th round, and 88th selection overall. 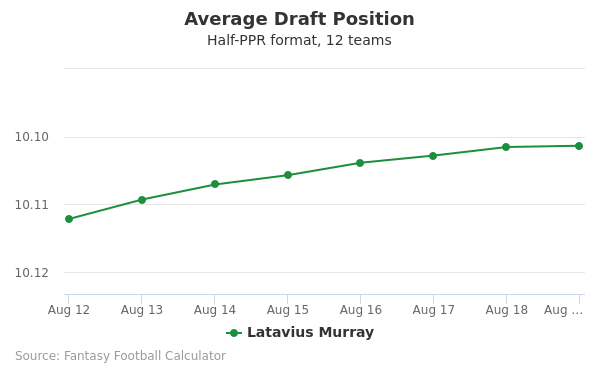 The code below will display a graph that updates every day to show the ADP data for Latavius Murray for the past 30 days in 12-team PPR leagues. Draft Emmanuel Sanders or Latavius Murray? Draft Jared Goff or Latavius Murray? Draft Christian Kirk or Latavius Murray? Draft Josh Jacobs or Latavius Murray? Draft Latavius Murray or Royce Freeman? Draft Carlos Hyde or Latavius Murray? Draft Jared Cook or Latavius Murray? Draft Latavius Murray or Marvin Jones? Draft Dante Pettis or Latavius Murray? Draft Cam Newton or Latavius Murray? Draft Courtland Sutton or Latavius Murray? Draft DeSean Jackson or Latavius Murray? Draft DK Metcalf or Latavius Murray? Draft Austin Ekeler or Latavius Murray? Draft LA Rams Defense or Latavius Murray? Draft Latavius Murray or Sterling Shepard? Draft Jameis Winston or Latavius Murray? Draft Latavius Murray or Tom Brady? Draft Golden Tate or Latavius Murray? Draft Gus Edwards or Latavius Murray? Draft Latavius Murray or Matt Breida? Draft Adrian Peterson or Latavius Murray? Draft Latavius Murray or Trey Burton? Draft Devin Funchess or Latavius Murray? Draft Baltimore Defense or Latavius Murray? Start Emmanuel Sanders or Latavius Murray? Start Jared Goff or Latavius Murray? Start Christian Kirk or Latavius Murray? Start Josh Jacobs or Latavius Murray? Start Latavius Murray or Royce Freeman? Start Carlos Hyde or Latavius Murray? Start Jared Cook or Latavius Murray? Start Latavius Murray or Marvin Jones? Start Dante Pettis or Latavius Murray? Start Cam Newton or Latavius Murray? Start Courtland Sutton or Latavius Murray? Start DeSean Jackson or Latavius Murray? 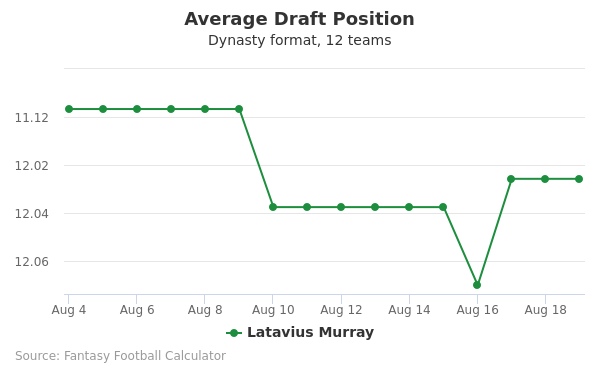 Start DK Metcalf or Latavius Murray? Start Austin Ekeler or Latavius Murray? Start LA Rams Defense or Latavius Murray? Start Latavius Murray or Sterling Shepard? Start Jameis Winston or Latavius Murray? Start Latavius Murray or Tom Brady? Start Golden Tate or Latavius Murray? Start Gus Edwards or Latavius Murray? Start Latavius Murray or Matt Breida? Start Adrian Peterson or Latavius Murray? Start Latavius Murray or Trey Burton? Start Devin Funchess or Latavius Murray? Start Baltimore Defense or Latavius Murray? Born in Orlando, Florida on January 18, 1990, to Paul Murray and Tawanna Wright, Latavius Murray spent his early childhood in Titusville, Florida. At the age of three, Murray, his older brother and his mother moved to Syracuse to live with his grandparents until they found a home. As a child Murray was frisky and curious, participating in different sports like soccer, basketball, and baseball. At the early age of eight, Murray played running back and linebacker for the Toulon Tigers football team. His outstanding performance caught the attention of the varsity coaches at Onondaga. Murray proceeded to attend Onondaga Central High School where he played football and basketball. Pulling more than 1,000 points over his high school career on the basketball court, Murray set a record as the school’s all-time leading point’s scorer. He served as running back for his football team, and his accomplishments were indeed impressive, conceiving two 2,000-yard seasons in high school. Also as the team's starting linebacker, Murray was chosen as the Class D Player of the Year, and as a senior, he was selected as Gatorade Player of the Year for New York State with a record of 78 tackles on defense and 2,194 yards on offense. He was nicknamed “Tay Train” in high school and till day, the name remains a part of his career. Murray was offered scholarship to Boston College, Connecticut, Syracuse and Maryland. He finally attended the University of Central Florida, Orlando the city where he was born. His father, Paul Murray still resided at Titusville, a short distance from the school and this gave him the opportunity to spend some time with his son, sharing his success on the field. Murray played football on a regular basis at UCF, making 45 appearances, rushing for 2,424 yards on 453 carries with 37 touchdowns. After posting over 1,000 yards rushing, Murray was nominated to the All-Conference USA First Team. In 2010, he was named the MVP of the Liberty Bowl for his impressive performance against Georgia. A fierce competitor, Murray attributes his competitive spirit to both parents Paul and Tawanna. As the first person to hand Murray a basketball, Paul was an excellent track and field athlete, and he also got involved in other sports in high school. Tawanna was equally a basketball player in high school. Murray's childhood dream was realized in April 2013 when he became the 181st player drafted in 2013 NFL Draft, progressing in the sixth round to the Oakland Raiders. He signed and sealed a four-year contract which included a $106,200 signing bonus, $106,200 guaranteed, and an average annual salary of $566,550. In 2016, Murray earned a base salary of $675,000. As a result of an ankle injury Murray sustained, he was unable to play during his rookie season. This was the first time in his life that he had to sit out and just watch the game without being actively involved. More determined and stronger, Murray bounced back to the scene in his second season and made tremendous achievements. He was not invited to NFL combine but he got more attention after his impressive performance at Central Florida's Pro Day where he ran the 40-yard dash in 4.40 and a 40 time of 4.38 seconds. He had a 10-foot-4 broad jump and a 3-inch vertical jump. In the 2015 season, Murray played his team’s lead running back and became the pioneer Raider to rush for over 1,000 yards in one season within a five year period. The highlights of Murray’s NFL career to date reveal that he has rushed for 1,490 yards on 348 carries and a total of eight touchdowns. Check out a fantastic highlight on Youtube. In the 2016 season, Latavius Murray finished playing in 14 games, rushing for 788 yards and 12 rushing touchdowns. Latavius Murray married his longtime girlfriend Heidi Mueller in 2015. His twitter username is @LataviusM while his Instagram username is @lataviusmurray. His jerseys sales can be found here while his autographed items are found here.